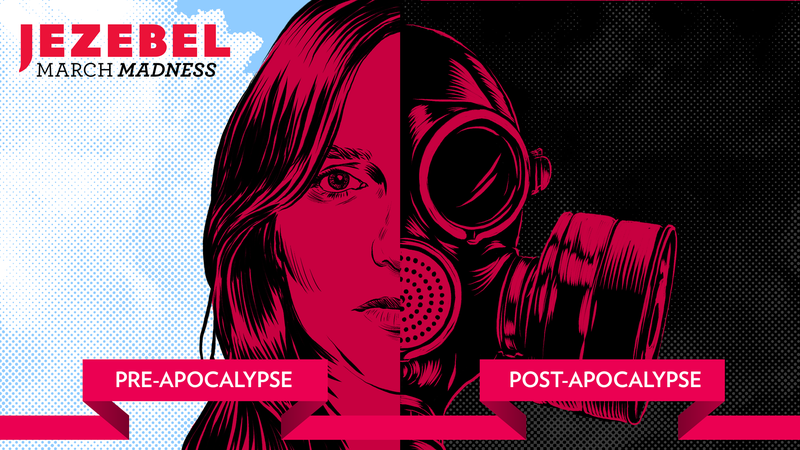 It’s another beautiful day in Jezebel’s March Madness: Pre-Apocalypse vs. Post-Apocalypse, where the competition is fierce and death looms ever closer. Birth Control (1) continues to smash the competition left and right, beating the heck out of Chopped Salads (8) with 92 percent of the vote. Say goodbye to your whale friends, cause Bees (4) took a healthy lead over An Ocean With Fish In It (12), while Pets (11) totally trashed Anti-Depressants (3) with over 80 percent of the vote. 70 Degree Days (2) beat Iced Coffee (7) by a lot, sorry to my java freaks, while Wellness (16) continues to slip through with a huge lead over Postmates (9), a seed that sadly just never had the name recognition. No offense to Jeff Bezos but Indoor Plumbing (12) absolutely tore Alexa (4) apart with 99 percent of the vote, and the battle between Online Shopping (11) and Sephora (3), which I erroneously described as “an impossible choice,” ended in an overwhelming and frankly devastating defeat for Sephora, where I will be making a very short pit stop after work. Finally, Automatic Bill Pay (10) has defeated Tinder (2) with a full 88 percent of the vote, because everyone’s priorities are evidently very much in check. We begin in the Post-Apocalypse Nature Division, where Mad Max Fashion (16) will take on Soylent (9). Which will you choose? Something fun, or something that was explicitly created to be the least amount of fun possible? Nearing the end of Round Two, the Rise of Cults (6) goes up against Rebel Citizen Radio Networks (14). It’s really about what type of community is best for you, right? Lastly, Road Trips (7) will take on popular contender No More Student Loan Debt (15). This is going to be tough for Road Trips, but then again, who wouldn’t want to take a long drive with friends down California’s Highway 1, listening to tunes, hitting the vape, gazing out at a bubbling purple ocean? Wow, what a round! What a round. We’re having fun—who doesn’t love to think about the dead ocean, am I correct? Yes! Below is your updated bracket, and we’ll see you back here on Monday!